It’s been a great start to 2015 so far! I’ve performed in shows produced by Caravan of Glam and Miss Alex Kennedy and have been diligently prepping for the next Pepper + Bones Presents: Anything Goes Burlesque. Wanda Bones and I are bringing out fourth co-produced show to the Funhouse Lounge on Friday March 13! Friday the 13th. The Ides of March. Do you give significance to these ominous dates? What happens when you embrace the tumultuous history of formidable calendar events and celebrate the strange and wild energy of them? Make a new tradition of these unlucky dates and join us for Pepper + Bones Presents: Freaky Friday. This ‘Anything Goes Burlesque’ show will take your wild feelings for superstition and mystery, add to it, and then pull it out from under you like a magician whipping a tablecloth out from under a complete (though slightly rattled) set of dinnerware. 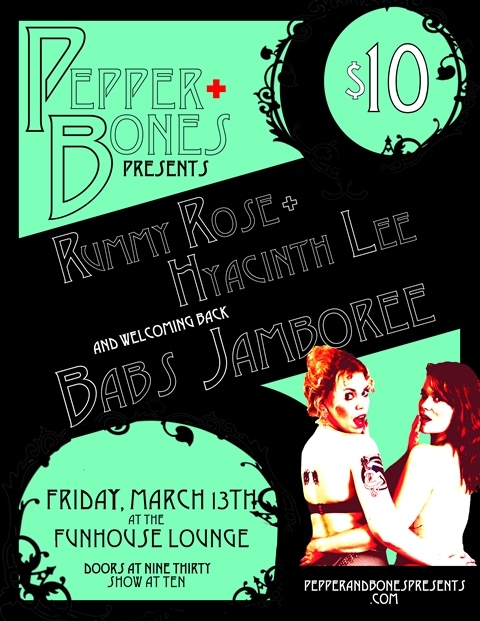 Pepper + Bones Presents returns to the Funhouse Lounge on Friday March 13. Doors are at 9:30pm, show at 10pm. Admission is $10 cash at the door. Beginning with one of their signature duet performances, Dee Dee Pepper and Wanda Bones bring you an amazing line-up: the raven-haired beauty Rummy Rose, the gorgeous Hyacinth Lee and, back from hiatus, the incomparable Babs Jamboree! Pepper + Bones Presents: Dee Dee Pepper and Wanda Bones are often out fighting crimes and predicting the future. When they’re not too busy keeping the universe in order, they produce saucy, funny and devilish burlesque shows for the people of Portland, Oregon. Audiences are treated to solos, duets, co-emcee and subject strangers to interactive games. In addition, there are performances from the crème de la crème of Portland’s finest strip-tease artists. Top Drawer, indeed. These fine shows are presented quarterly at the Funhouse Lounge. Don’t miss a single one! Dee Dee & Wanda promise all of the following: making out with strangers, clown room, cocktails, T&A, beautiful people and more. Get there.